Medicine: About five or six weeks ago, my dad thought he pulled a muscle while playing soccer with my nephew. Last week he finally saw the doctor who diagnosed a torn Achilles tendon. Last Friday they scheduled the surgery for Tuesday to repair the damage. Everything went exactly as planned; he charmed everyone there and is on the long road to recovery. Growing Up: Normally, I would have sat with my mother during Dad’s surgery, but we’d already scheduled my daughter’s special riding lesson and couldn't cancel, although in hindsight, I wish we had. Lisa and our brother were both out of town for the holiday week and the surgery was scheduled rather quickly. Instead my 12 yr old daughter stayed with her Nana and helped. I’m so thankful that she showed the maturity and caring towards her grandparents to step up and be there. Surprises: Four and a score years ago I spent a summer internship in Washington DC in the Office of Public Liaison for the Bush 41 administration. Now I belong to the Bush Alumni Association and receive invitations to all kinds of interesting lectures and dinners in College Station as fundraisers for the library foundation. 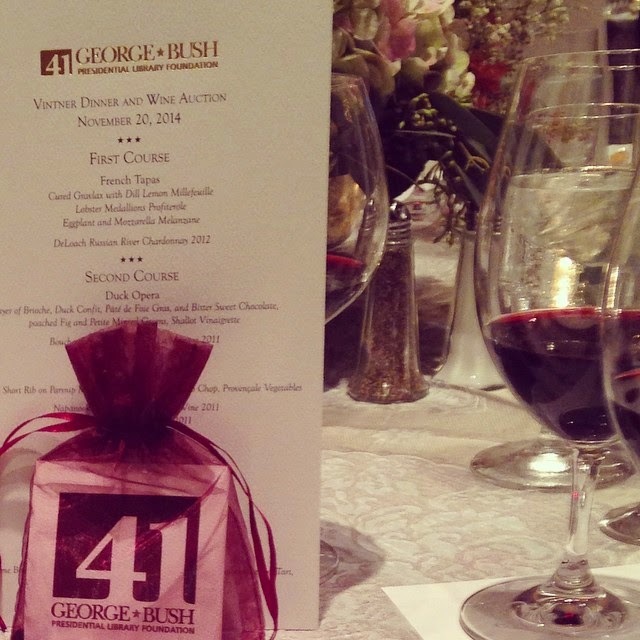 One of the more recent invitations was to a special Vintner’s Dinner with Dennis Miller as the guest speaker. I laughingly showed it to my father at the office in one of those “oh ha ha look at these invitations-who goes to these things” moment and he surprised me with tickets! What a fascinating adventure! Who goes to these things? Well, my husband recognized former Houston Oilers player Ray Childress, the former head coach of Texas A&M R. C. Slocum, and Wade Phillips, son of the iconic legendary beloved Oilers head coach Bum Phillips, and former head football coach of Dallas Cowboys. The three couples at our table included a French vineyard representative and two business owners. There were six or seven wines paired with dinner – I lost count – with some surprisingly delicious food. Dennis Miller performed a splendid mix of humor with respect towards former President Bush 41 who was in the audience with his wife Barbara. Neighborhoods: We've had such beautiful weather for the past week that I've been taking my two younger kids to the nearby playgrounds. They've had so much fun chasing, racing up to the top of the play structure to slide down. My three year old is getting really good riding his tricycle on the wide sidewalks. It's a real blessing to have a great neighborhood where my children can bike and play safely. You: Lastly, I'm so very thankful for all of you who visits with us here at Of Sound Mind and Spirit. The past five years have been a journey I never could have predicted and it's been a real blessing making so many new friends. I pray for you often and wish the best for you always. Thank you for visiting with us, commenting, and sharing our time.